In Windows 7 with Aero enabled, Aero Peek feature, also known as Desktop Preview, will also be enabled and turned on, where all windows is temporarily hidden in order to show the desktop for user’s viewing when user moves the mouse pointer to hover over the Show Desktop small rectangle button at the end of the Taskbar. When the open windows are hidden, only outlines or borders of all windows are shown, allowing users to peek behind all open windows to see the desktop. 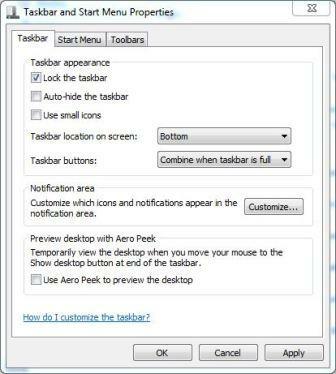 For Windows 7 users who don’t need the Aero Peek feature, here’s how to disable and turn off Aero Peek. Right click on blank space on Taskbar, and click Properties. In the “Taskbar and Start Menu Properties” dialog, make sure that Taskbar tab is selected. Uncheck or untick the Use Aero Peek to preview the desktop option. Right click on the Show Desktop small rectangle button on the far right end of the Windows 7 Taskbar. Click on Peek at desktop option on the context menu so that the tick next to it disappears to disable Aero Peek. Go to Control Panel -> System and Security -> System, and click on Advanced system settings link on the left pane. In “System Properties” dialog box, make sure it’s on Advanced tab. Click on Settings button under Performance section. In “Performance Options” dialog box, make sure it’s on Visual Effects tab. Untick and uncheck the Enable Aero Peek option. Note: System will automatically select “Custom” radio button, if the advanced configuration has never been customized before. 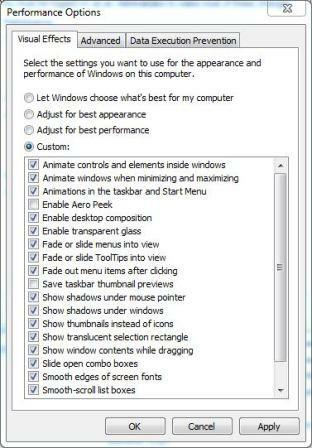 More Windows 7 tips and tricks or usage guides.